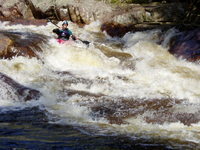 Depending on the level this creek can be a great training ground for paddlers learning to creek, a beautiful and fun run, or a challenge for advanced boaters. 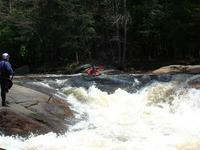 Run either as park and huck, or as a full river run with a creeky finish, this is a classic! Starting at the Donnattsburgh Road bridge the creek is a straightforward river run at lower water and at high water a rocket ride boofing over holes and rocks. Once past the powerlines the river becomes less continuous and the first drop appears. Scout on the left, or boat scout running down the left channel. After the first drop is the Fat Lady. Starting in a pool above an old dam the currrent is devided by a massive rock named Mega Dome. Stay left unless you have scouted for wood in the right channel. The main line is left at the dome, then right at the split to stay in the center channel. To the far left is a channel which goes into a hard corner with a jutting rock known as Elbow Breaker. Despite the name this channel can be run safely at almost any level. The river converges again for a boof just above the Rudd Road bridge. Eddy out below the bridge and scout The Wall. The Wall starts with a channelized entrance into a left to right move to avoid getting body slammed on granite. From the eddy on the right work your way down through the next ledge to river center. The last boof is formed by two large rocks in river center. At lower water it is easy to fall between the two rocks. Be aware of the pin hazard and plan your line so you are clear. Either cross the devide high and boof right, or stay left. Take out at the next bridge on river left. This is Pine Grove Road. Want a run that you can take beginners on but still have some fun? Run from Donnattsburgh Road to Rudd Road and let beginners walk the slide or run their boats down for them. The Independence River was named to honor the national holiday by surveyor/engineer Pierre Pharoux in the 1790's. In those days, the French called the Salmon "La Famine." If the Indy's rocking (800+ cfs and rising, or 1000+ cfs), it can be great fun to combine it with a run down its trib, Otter Creek, just a mile South on Pine Grove Road. Run Otter first, as it'll drop more quickly. The gauge is just downstream of the putin, on the downstream river right-side of the bridge. Photo of Bubba by Steve Graley (PhantomBoater) at 260 cfs on 05/05/02. This rapid needs a good name. There are several ways to run this boof, but the picture shows one of the most popular lines. Photo of Hans Merritt by Adrian VandenBout on 11-12-05, at 440 cfs. This is the Big One, the reason why people run the Indy. It starts with a weird slide by an old diversion dam. Typically, the boater heads left for the big slide (pictured), although it's possible to head right for a narrow channel with a fierce hole. 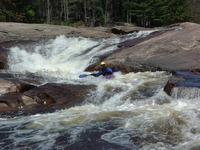 The runout leads the paddler to the boof at the bridge (next rapid). Photo by Steve Graley of Jim Mumme on 5/2/02 at 250 cfs. This is typically regarded as the last drop of the Fat Lady. (Note the slide way up there in the background). You can see it coming by looking for the old bridge above the river. There are creases and channels you don't want to be in, but at normal levels, this isn't too tough a drop. Scout from the bridge. 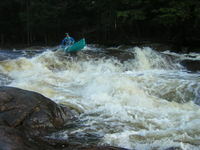 Photo of Mike Nickel by Steve Graley on 5/2/02 at 250 cfs. Soon after the bridge is the last rapid. The intrepid paddler hugs the left wall and then heads out into the center through a chaotic jumble of boofs, holes, and messy stuff. Scout from the bridge. 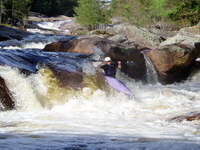 Photo of Marty Murphy by Phantomboater at 310 cfs on 5/17/03. As of 10/18/2014 there is a large root ball in the center line of Fat Lady, right at the base of the middle drop. Scout and run either of the other two lines with caution. Edit: Root Ball removed this is no longer an issue. As of 10/25/2014, the root ball was removed from Fat Lady. The center line is now runnable thanks to the rope work and efforts of at least 10 people. Click the Flows tab for a break-down of the river at every level. Turn right on River Street/ Rt.22. Continue straight at the stop sign. Continue Until you pass over the first major stream. Look for Rudd Road or the sign that says Independence River. Turn right on Burdick's Crossing Road. There is a drive-in movie theatre you can use as a landmark. Continue until the road ends. Turn left onto Pine Grove Road. Continue until you see the next stream. There will be a sign that says Independence River. To get to Fat Lady and the Wall simply take Rudd Road to the bridge. It is accessible from both sides of the river. Go South on Pine Grove Road. Take a left on School House Road. Turn left on Chase Lake Road. Take the second left onto Donnattsburgh Road. Continue to the end and park in the gravel lot. Coming through the entry of "The Dome"
Steve said it doesn't look like there's anything else. Subject: Jim Mumme aka "Rope"
Nearing the last section with finesse ! This is more like it ! Making this look so easy !